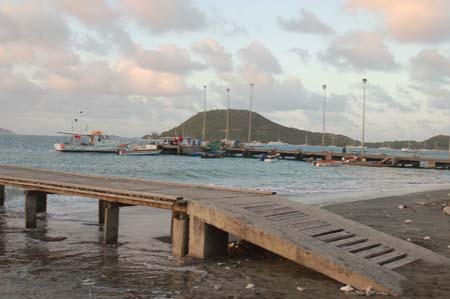 The approach to Petite Martinique requires that you reach around a long L shaped reef extending west and curving south from Petite St. Vincent. 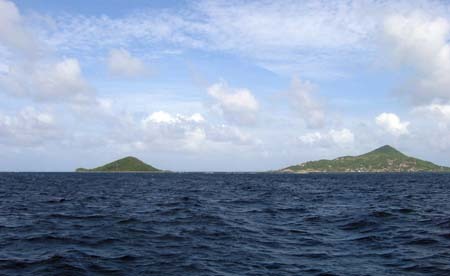 There is a second reef between the two islands at the east end of the anchorage and several reefs between Carriacou and Petite Martinique. Its wonderfully protected and you can anchor anywhere among the local boats in front of PM. A favorite with cruisers is a long sand bank off Petite St. Vincent. Palm Beach Restaurant will pick you up from there and take you over to PM for dinner. Its an international boat ride - and its free! There is not much to give away what decade you're in (or even if you're in the 20th century) on Petite Martinique. 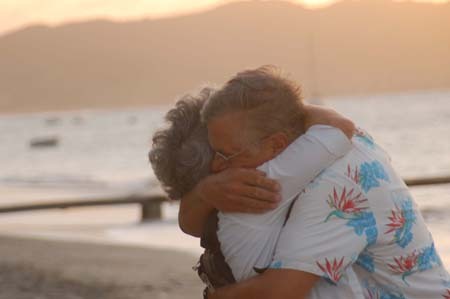 The people are industrious and hardworking fishermen and businessmen and enjoy a high standard of living. 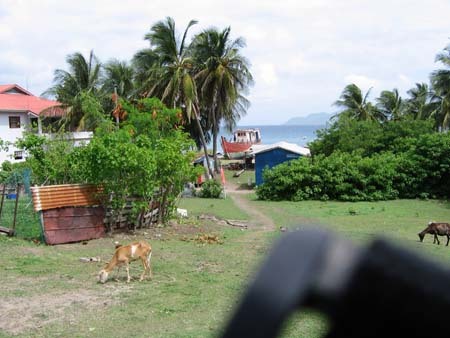 Goats, chickens, and children roam freely. 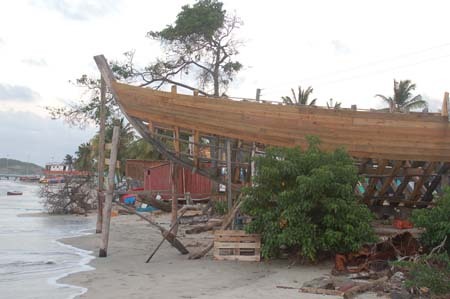 The building of boats starts with gathering logs and laying a keel. Generally there are only one or two people buiding these boats with hand tools. When it comes time to launch, everyone gets involved in hauling the boat into the water. Everything legal that comes on and off the island comes via boat to lhese docks where workers gracefully sling the cargo to and from the boats by hand. It is a pleasure watching the children bounding off the school ferry in the afternoon.